There isn’t much information about Emetophobia, better known as the fear of vomit and easily one of the most common phobias. If not treated well and in time, it can have life-changing ramifications. Find more about Emetophobia in the following posts. This highlights the characteristics and symptoms of the phobia of vomiting, emetophobia, as well as its successful treatment. 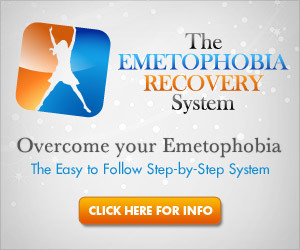 Get the facts on how people become emetophobic and where to find emetophobia treatment. I have a friend who may have this disorder. I know that she has mentioned to me that she absolutely cannot abide vomit or vomiting. I am scared to throw up, but not the way she is. I asked her once how she has gotten through years of parenting and she said that she was very lucky that it had somehow worked out for her that she never ended up having to clean up vomit. I guess her husband has always been around to take care of it when one of her children has been sick. I don’t have emetophobia and I can’t clean up vomit, either. With me, it’s that it triggers a severe gag reflex and I end up vomiting, too. My husband and I had a deal – he always dealt with vomit when the kids were growing up or he knew he’d have twice the mess to clean up. I can see this becoming a phobia just because I loathe vomiting and I’m sure most people do. Right, I think most people want to avoid vomit, that’s natural. When it becomes a part of how and why you make life decisions, then it becomes an actual condition such as emetophobia.